When I first came across this Spiced Yam Chips recipe on the amazing eat make read blog, I was BEYOND excited to try it. The flavor combination sounded incredible, and the idea of a lime yogurt dip intrigued me. I couldn’t wait to get in the kitchen and try this, and I am so glad I did…WOW! They were delicious. At just 5 Points, it’s a wonderfully filling and flavorful healthy snack recipe, that would also be a good side dish recipe, and is super easy to make. The sweet and spicy flavors of the yam chips perfectly contrast the deliciously tart lime yogurt dipping sauce, and it is oh so yummy. I really didn’t have to do much to her original recipe. But most importantly, I used a non-fat cooking spray instead of using olive oil. This cut way back on Weight Watchers Points in the recipe, so the yam chips won’t have that fried, crispy texture, but I feel that it’s definitely worth the sacrifice, and it really doesn’t affect the overall taste. 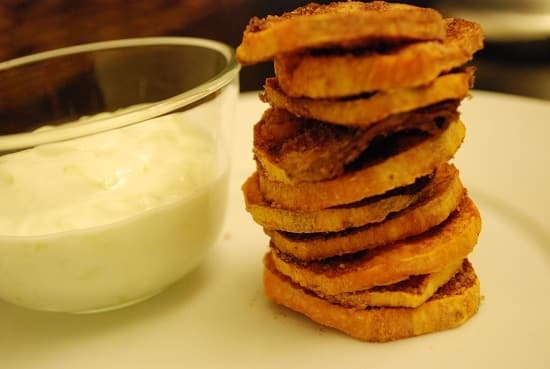 Truly, an amazingly decadent snack recipe, these Spiced Yam Chips are perfect to add to your list of Weight Watchers Super Bowl Recipes for Sunday’s big game, or to just indulge in by yourself, any old time you want. The prefect gourmet snack idea for your healthy Super Bowl Recipes collection, these Spiced Yam Chips are just as tasty as they are good for you. Just 5 Points gets you a nice serving of yam chips and dipping sauce! To make the dipping sauce, mix the yogurt, sugar, lime juice and lime zest in a small bowl and set aside. Scrub, peel and thinly slice the sweet potatoes. In a small bowl, combine salt, cumin, and cinnamon. Spray a baking sheet with non-fat cooking spray and lay the potatoes out on the sheet. Then spray the potatoes with the non-fat cooking spray. Gently sprinkle the potatoes with the ½ of spice mixture and bake for 20 minutes. Flip the potatoes, spray with the non-fat cooking spray, and sprinkle with remaining spice mixture. Place back in the oven and bake for another 15-20 minutes, until potatoes are browned and crisped. Wow! That sounds amazing! Thanks for sharing! I’m going to try these on the weekend!